Fusion Holidays Ltd was founded in 2013 trading as Fusion Cruises selling cruise holidays via our website www.fusioncruises.co.uk. Fusion Holidays is an independent award winning travel agent and has established itself as one of the UK’s leading cruise specialists carrying thousands of passengers worldwide. Following customer feedback and demand we decided to set up our first retail store in Rustington, enabling us to offer a comprehensive travel service to new and existing customers alike. We welcome you to our new store and look forward to helping you with your future holiday plans. 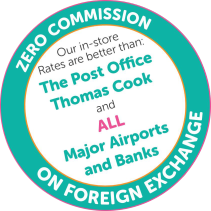 Fusion Holidays when selling travel arrangements is a trading name of The Midcounties Co-operative Ltd. Fusion Cruises is an Accredited Body Member of Midcounties Co-operative Travel Consortium. (ABTA:P6652, ATOL:6053).